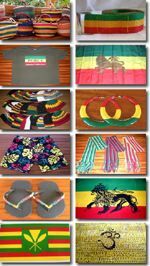 Reggae Rasta Hawaii.Com (reggaerastahawaii.com) is a full service, online retail shop that offers a wide variety reggae, rastafari, Jamaican and Hawaiian themed merchandise, clothing and accessories. We believe that our products not only reveal our high standard of quality but also promote our message of one love, freedom, peace and unity. We offer a great selection of women's, men's and children's apparel from t-shirts, dresses, sarongs and shorts among others, as well as a variety of accessories that feature the vibrant colors. Feel free to browse through our website. Once you are ready to order any of our items, our simple and secure online e-commerce system (driven by Safe and Secure PayPal ) will help you throughout your online shopping process.